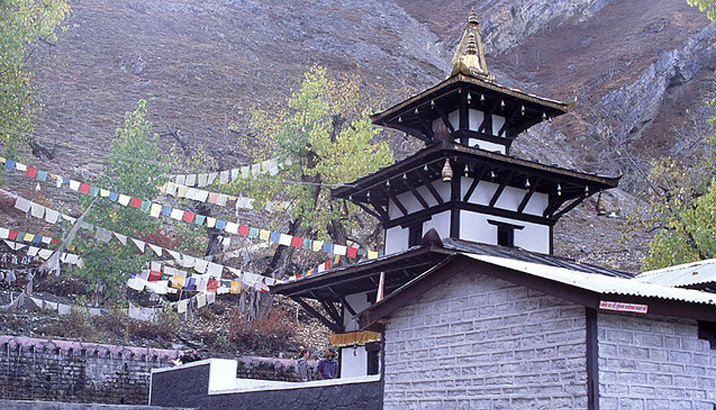 Muktinath is a sacred place both for Hindus and Buddhists. Muktinath signifies ‘liberation’ or ‘Moksha’. Muktinath Valley is situated in an altitude of 3,710 meters at the base of the Thorung La Mountain Pass in Mustang district of Nepal. Muktinath is one of the most ancient Hindu temples of God Vishnu, one of the divine power in Hindu mythology. Similarly, in Buddhist tradition, this is a holy place where Padmasambhava, the founder of Tibetan Buddhism had meditated on his way to Tibet. The sacred river of Kali Gandaki river flows downstream along the Muktinath. Kaligandaki River is a source of Saligrams from which temple of Vishnu is built. The main source of all Silas or Shaligrams which are required to establish a temple of Vishnu anywhere in the world are found in the waterway downstream from Muktinath. Muktinath Temple possesses 108 water springs which makes the place truly divine. It is a belief that to bath in the water here provides salvation after death. One can take a flight from Kathmandu to Pokhara and then from Pokhara to Jomsom Airport .There are many ways to travel to Muktinath either you trek all the way or take a jeep . Shivam Group Holiday Private Limited has been operating pilgrimage tours to Muktinath and various other places. We organize the best tours, trek, holiday and Yatra all across Nepal, India, Bhutan and Tibet. With our full professional assistance guided through local expertise, we aim at providing the best time of your life exploring the true wonder of Nepal.